Emplacement idéal dans le village piétonnier au-dessus de la chaussure Médecins pourvoiries et 1 Bldg des remontées mécaniques et la télécabine. Une vue imprenable sur les montagnes et surplombant l'étang. Would have preferred curtains on all windows. Normally palladium or vaulted ceiling arched windows do not have curtains however we did arrange a temporary curtain to help with daytime sleeping. We hope it helped. Great location. Nice and helpful owners. Comfortable beds. Lovely fireplace and mountains decor. Easy to pop out and grab a cup of coffee or pizza. There is an elevator which is nice with kids and ski gear and luggage. You can’t park very close if the road is icey and you don’t have a 4 wheel drive. But the parking is only a 4 min walk away. The kitchen is very small which works for quick breakfast and easy meals burn woild be hard if you are going to want to cook a lot. Nice steam shower and jacuzzi tub in the master which is upstairs from the other rooms. 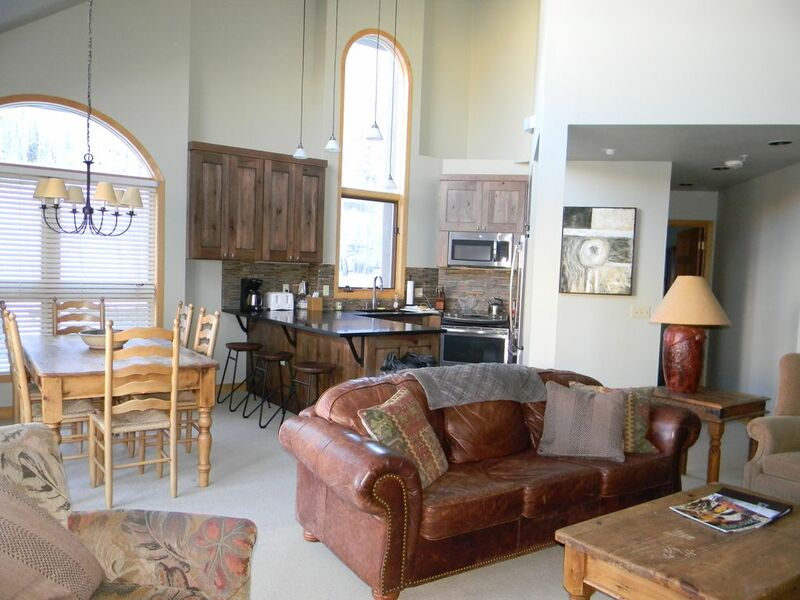 Excellent Condo in Mountain Village for the Skiing vacation. We stayed here in January 2019 and was extremely please with the accommodations. The condo is very nice and was very clean and the location was excellent. It isn't a ski in and ski out location as you have to walk about 100 yards or so through the main mountain village plaza to get to the snow but it is an easy walk. The Condo is right above the boat doctor where you can rent skies or other equipment, it is also right in the middle of all the action in Mountain Village so you don't have to go anywhere for food or drink unless you want to go into Telluride proper. My only complaint about the condo was there could of been more cooking supplies such as pots and pans and cutting knives but that was just a small thing. There a good supply of cooking material I was just looking for a bit more. The kitchen is small but works very well and the gas fireplace made for a comfortable stay. The steam showers are a great addition and I would stay here again if I was to be in Mountain Village. Location Couldn't have been better! Great location in the heart of Mountain Village. So convenient to Peak's spa, ski school, town and market gondola's etc. Unit is in great condition and well maintained. Very happy overall with our stay. Thanks so much for making our holiday so wonderful. We are so glad you had a great stay. Happy new year. John, the owner, was very helpful throughout the process. The unit was conveniently located and had a nice view towards the mountains. We enjoyed our stay and had no complaints. Nice, clean, comfortable place. good location. Parking a little inconvenient but that is the whole mountain area. Be careful of the one bathroom, nice full length window that people can see in.